I can clearly remember the clang of a riot cop's baton striking the aluminum ladder carried by fellow photojournalist Rick Friedman as years ago we covered neo-Nazis exercising their right to free speech in Boston. I also remember the same cop taking aim and hitting the bone at the joint of my right knee. I guess Rick and I needed such encouragement to move back from the action. Why was Rick carrying a ladder? Anything to get a different angle on things. I thought of Rick as I brought my ladder to get a fresh viewpoint on the picket line of union nurses staging an one day strike in early October protesting an impasse in contract talks with Baystate Franklin Medical Center in Greenfield, MA. Quite a thing for nurses to go on strike. 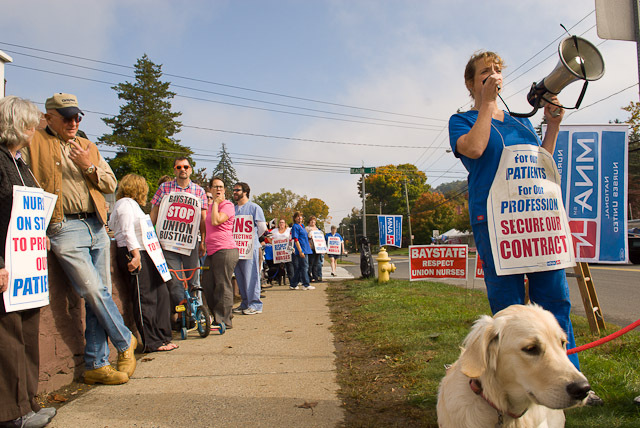 The nurses told me that the offered contract will adversely affect patient care given the terms related to overtime pay and sick time guidelines. I have no idea what the contract issues really are, nor what a just resolution would be. However, it is clear that both sides have very different points of view. With this shot, I crouched down for a low angle of registered nurse Karen Boyden leading chants. Viewpoints. Points of view. Angles. Stances. Sides. Perhaps we all need to carry metaphorical mental ladders to aid understanding those who think differently from the way we do. better ladders than batons, no?